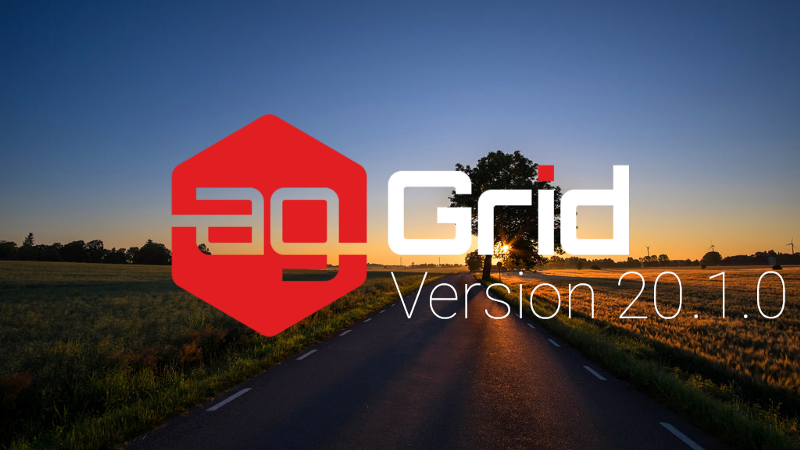 A little more than a month has passed since our last major release and we’re already rolling out a new version of ag-Grid. We’ve taken this time to work on the number of handy features that make our grid even more customizable, fixed over 100 bugs, worked on the grid’s events functionality and made significant performance improvements in rows processing with Client-Side Row Model. The most interesting features that we’ve added include the possibility to add custom filter options to the provided Text, Number and Date filters, custom tooltips and allow a custom loading component for the Server Side Row Model. Besides that, we’ve put together a new easy-to-understand guide on the Server-side Row Model that uses a very simple Node.js setup on the backend. This guide is intended as a starting point when learning how to use the Server-side Row Model, as it provides a simple grid implementation that uses a limited set of features and grid configurations. The custom filter logic is implemented through the test function, which receives the filterValue that a user typed into the filtering input along with the cellValue from the grid, and returns true or false. You can read more about the customization options in the documentation. Have you ever wanted to add your own handling for use cases involving a user pressing certain keys while the focus is inside the grid? For example, customizing the default browser behavior when a user presses Ctrl+C combination inside the grid. Well, in this release we’ve made such customizations possible. Using this functionality you can either turn off some default behavior or implement your own customized versions instead. In this release as always, we’ve also worked to improve our already impressive performance. Here’s one particular use case that we’ve worked on. It involves the grid configured to use the Client Side Row Model and displaying tens of thousands of rows grouped by arbitrary criteria. Once the dataset changes, e.g. a record is added, updated or deleted, the grid has to process changes and update grouping results with regards to sorting, filtering, aggregation etc. Previously, regardless of the change, all groups were processed which could sometimes cause lagging behavior. With the new improved architecture changes to the dataset are streamlined to only visit the changed groups. It means that if you remove one row, only the group the row belongs to gets re-sorted, filtered, aggregated etc. This gives massive performance improvement for large datasets with small localized data changes. Another significant improvement in performance you’ll notice in the use cases where the grid needs to calculate row height dynamically. Before this release, the grid was calculating row heights for all rows in the grid when the data was set. For large datasets, this was a performance bottleneck as calculating row heights can be a time consuming operation. Now the grid only calculates the heights of rows that are visible on the screen. For example, if there are 10000 rows in the grid, but only 20 are visible due to vertical scrolling, the grid calculates the height of the 20 visible rows only, and calculates heights of other rows as the user scrolls down. Sometimes you may need to update columns setup after the grid has been initialized, e.g. add or remove columns, change their width etc. This can be done by updating the list of column definitions. When new columns are set, the grid will compare column definitions and figure the differences. However, some properties like width or columnOrder are ignored. This is done on purpose to avoid unexpected behavior for the application user, like resetting width or changing column order when a new column is added or removed programmatically. In this release, we’ve added the option to override this behavior. If you set the configuration option deltaColumnMode to true the grid will apply changes for all column attributes each time the application updates the column. Start using ag-Grid in your project.